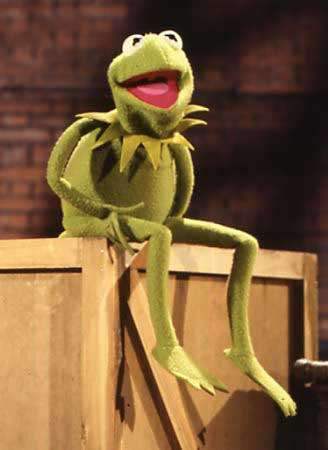 It ain't easy being Green, ya know. Hello Humans... Kermit the Frog here. I've got a Holidaze message for you all. First... in defense of all my animal buddies, I'd like to say... DON'T EAT TURKEY OR... ahem... HAM for Christmas! Also... what's with you Humans anyway? You are supposed to be celebrating X-mas... you know, the birthday of your "Prince of Peace." Instead you're going to war in the Middle East. I don't think bombing the Iraqi peope is a very nice thing to do. What's worse... Holy Bethlehem is under military occupation and you ignore it. Unbelievable. I now think it's easier to be a Frog. And speaking of unbelievable... the Walt Disney Co. (yuk) is preparing to offer about $135 million for my parents, the Jim Henson Co. This is most upsetting... I HATE DISNEY and I don't want to belong to the RAT KINGDOM!!!!! So... in closing. May Peace prevail on planet earth. May you silly humans learn to get along with each other... and for Goddess sakes... DON'T LET DISNEY BUY ME!!!!!!!!!!!! !